Ahoy! 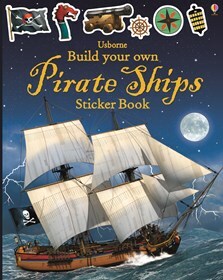 Young buccaneers can build the most fearsome pirate ships to sail the seven seas with this swashbuckling sticker book. There are over ten pages of stickers of sails, cannons, rigging and decks to build a privateer galleon, a Chinese junk and more. With information about each ship such as where it sailed and what kind of loot it carried.